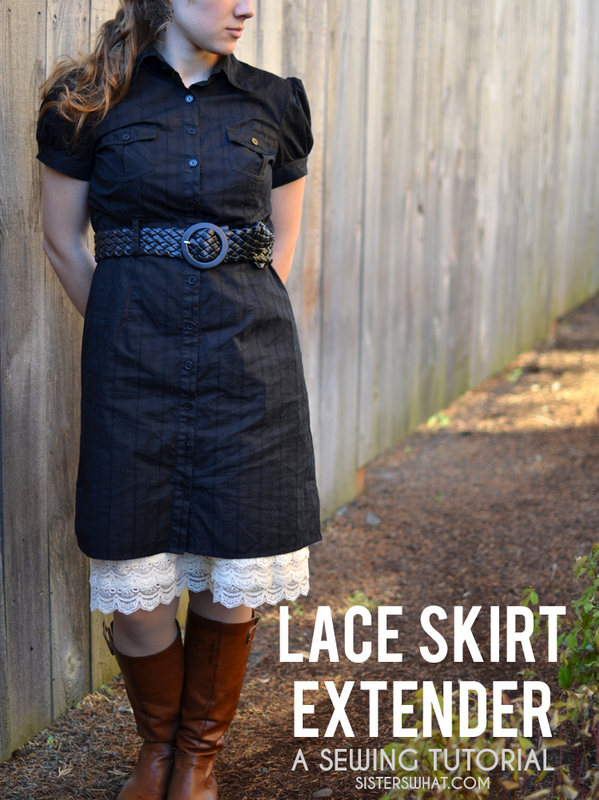 ' Lace Skirt Extender Tutorial - Sisters, What! For this past year, I've been really trying to to through my clothing stash to either get rid of or to refashion them. I've also been enjoying just sewing for myself. That is when I find time, which is a rare occasion. Anyway, I have a few dresses and skirts that I love, but I've always felt they were just a little short for my liking. I've seen lace skirt extenders in the store before, but for $25 I figured I could make my own. 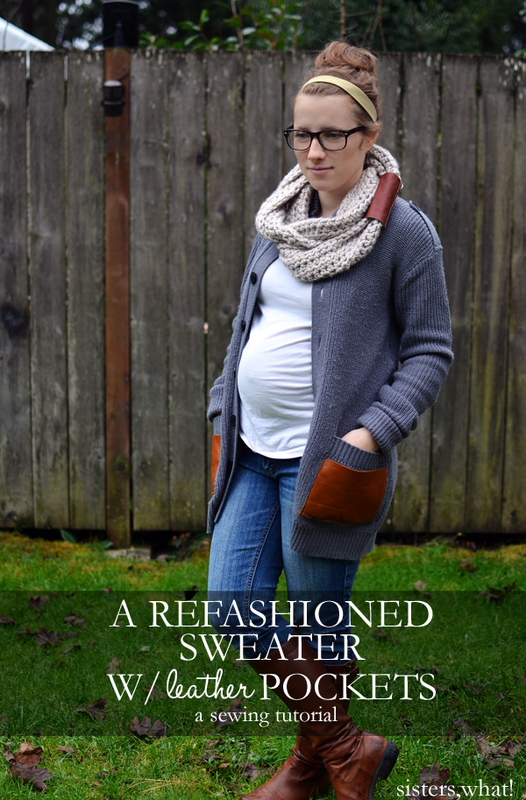 It was surprisingly quick and easy and I can wear it with most any of my skirts or dresses. I love feeling comfortable and modest, and having this lace slip really helps. Ya for modesty and being cute at the same time. Although I have a feeling that my grandma might be alarmed that my lace slip is showing : ). And what a perfect way to kick off your summer wardrobe. 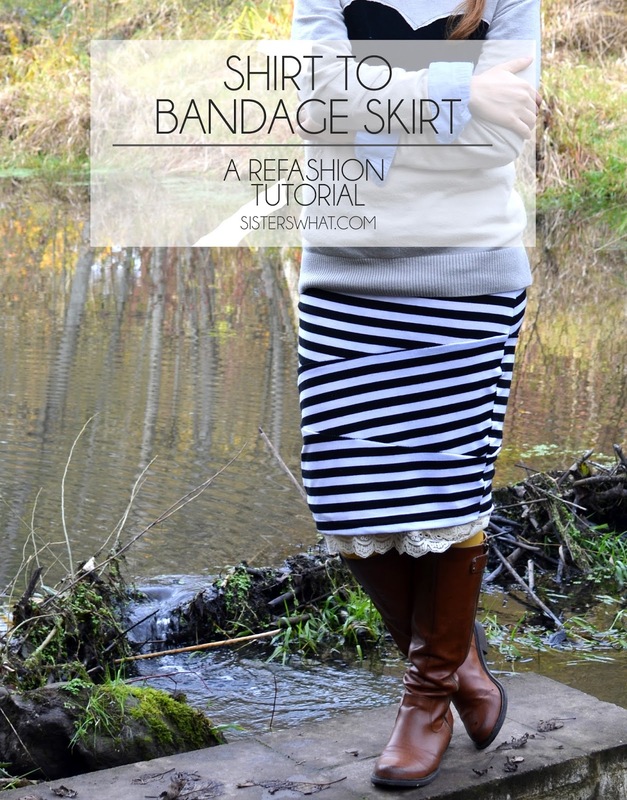 To make this even easier, you could buy or use an old slip and add lace to the bottom of that. Slip fabric - sheer rayon would work great. 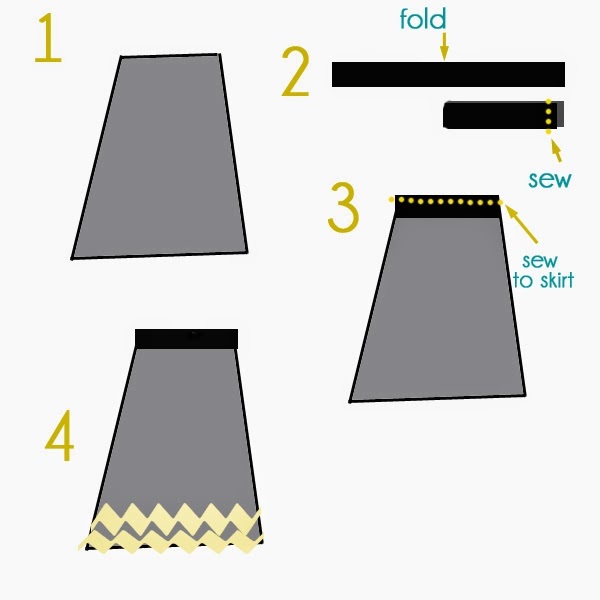 //1// After you have your fabric cut out, sew sides of the skirt together. On the top of skirt, baste stitch (extra long stitch) around the whole thing. Then gather until it measures your hip measurement. Now for the bottom of the skirt, make sure you hem it. //2// cut your elastic to be 2-4 inches less than your waist or hip measurement (depending on where you want you slip to sit on you). Fold in half and sew ends together. //3// attach the elastic to the skirt. to the skirt. Pick a part of your elastic and start pinning RIGHT side to RIGHT side of skirt. Then find the direct opposite side of skirt and elastic and pin. Now between the two pins keep trying to match the elastic and the skirt the best you can. You'll probably need to stretch the elastic as you do this. Now carefully start sewing the elastic to the skirt. You might need to stretch the elastic as you sew. //4// Sewing the Lace on: Measure and your lace to be the same width (plus an 1") as the skirt. Then start pinning it onto the bottom of your slip so that it is barely over lapping the hemmed bottom. At the top of the lace sew it on. 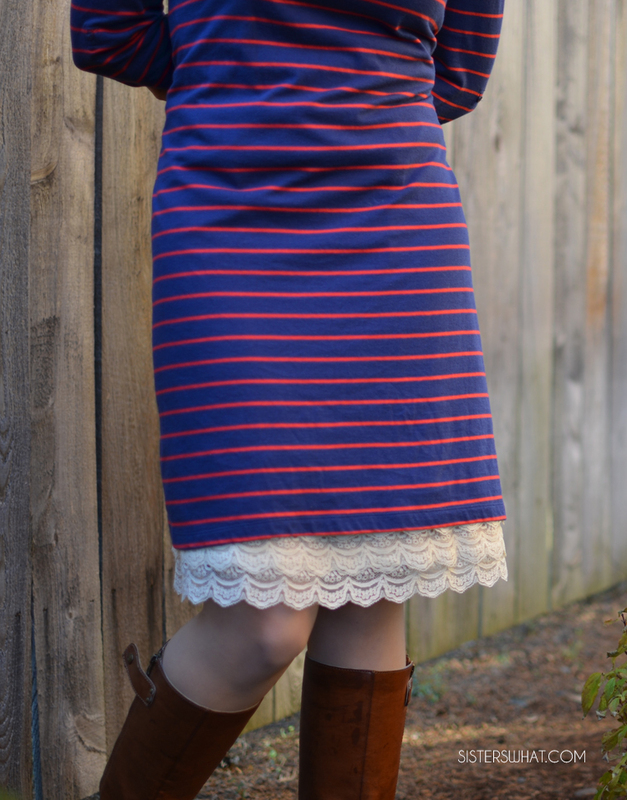 I added 3 layers of lace so that I could possibly wear the lace extender with more things. If you like to do that, then keep sewing another layer higher and higher up the slip. See super easy. Let me know if you have any questions. Darling! We're going to have to do this someday soon! How cute! 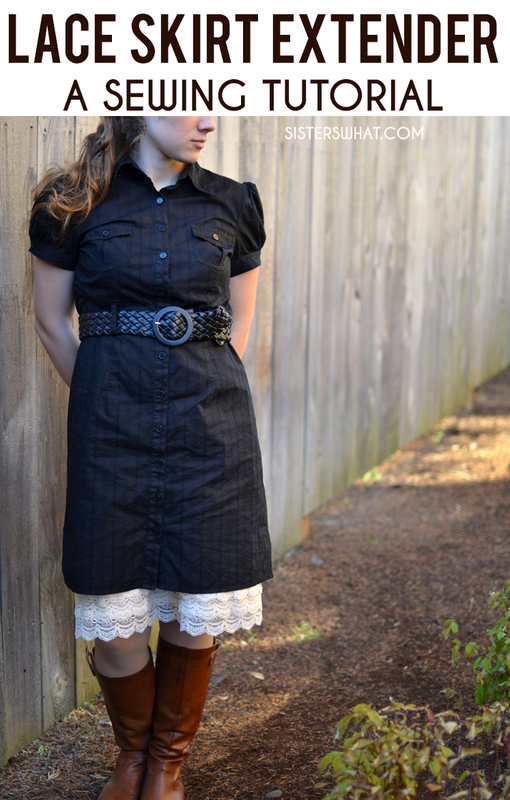 And it looks gorgeous with the dark dress and tan boots - perfect for Autumn!